Moscow (AFP) - Russian authorities were reluctant to celebrate the 100th anniversary of the 1917 Bolshevik Revolution on Tuesday, with just low-key events being held to mark an uprising that launched more than 70 years of Communist rule. President Vladimir Putin has overseen a crackdown on opposition activists and celebrating any sort of dissent, let alone a revolution, is at odds with his political keyword of “stability”. The Kremlin is not holding any special events for the day, his spokesman Dmitry Peskov said. Russian media had an ambiguous reaction to the centenary, with pro-Kremlin tabloid Komsomolskaya Pravda asking on its front page: "Great celebration or big tragedy?" 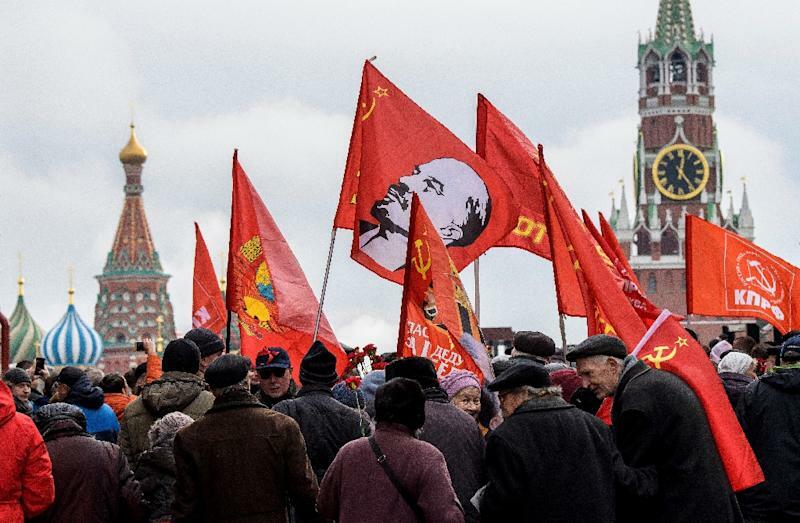 A procession of several thousand supporters of the Communist Party -- still the largest nominal opposition party in parliament -- walked through central Moscow waving red Soviet flags and pictures of Bolshevik revolutionary Vladimir Lenin. A group of participants was seen wheeling a cardboard Aurora cruiser -- whose firing of a blank on the Winter Palace is seen as the start of the 1917 revolution -- through central Tverskaya street. Another group carried a giant red banner yelling "Power to the Soviets!" as police looked on. "The October Revolution gave me everything," retired military flight navigator Nikolai Korotkov, 85, told AFP at the rally. "It educated me and it raised me." International delegations from Italy, Colombia and other countries were seen marching with the Russians, as party leaders complained about lack of free medical care and education in post-Communist Russia. Throughout the Soviet era, anniversaries of the revolution were marked with a public holiday which included pomp and military parades on Moscow's Red Square. Under Putin, November 7 became a regular working day in 2005. This year there was again a parade on the square, but the event was to mark the 76th anniversary of a parade during World War II, rather than the centenary of the revolution. The centenary is the last landmark event before a presidential election in March that Putin is widely expected to contest and win. Putin has skipped key commemorative events including a 3D light show this weekend on the facade of the Winter Palace in his hometown of Saint Petersburg. One of the few events linked to the centenary Putin has attended was the opening of a new church in Moscow, which he called "deeply symbolic" after the revolution led to the destruction of religious buildings and persecution of believers. Putin said this month that the revolution was "an integral, complex part of our history", emphasising the need for "treating the past objectively and respectfully". The Kremlin has charged a committee of politicians, historians and clerics with organising this year's festivities. Organiser Konstantin Mogilevsky stressed at a presentation last month that the events were "not celebrations" of 1917 but were intended to be a "calm conversation about revolution, aimed at understanding it". Russia's leadership is desperate to avoid repeats of the "colour revolutions" in other ex-Soviet countries, he said. Hundreds were detained over the weekend across Russia after exiled nationalist Vyacheslav Maltsev called for a "revolution" on November 5, with Russia's powerful Investigative Committee on Tuesday launching a probe into inciting mass riots and calls for terrorism. Most were still in police custody Tuesday, said OVD-Info group which monitors political protest arrests, while at least eleven received jail sentences of up to 15 days. The October Revolution centenary is largely passing unnoticed by the public, commentators said. "The country that once counted its existence from October (1917) is now seeing in its centenary in deafening silence," wrote historian Ivan Kurilla in the Vedomosti business daily. A report commissioned by the Communist Party found that 58 percent of Russians were not aware of the anniversary. November 7 is still a day off in neighbouring Belarus under the Soviet-style rule of President Alexander Lukashenko. But the last other such country, ex-Soviet Kyrgyzstan, cancelled its November 7 public holiday this year.